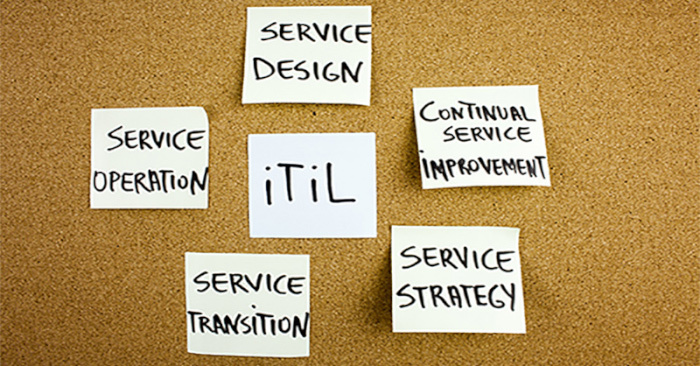 This a practical guide to using the ITIL Service Lifecycle approach. It is an approach to IT Service Management (ITSM) that organizations of all sizes can use to manage the full lifecycle of not only IT services, but really any service offering. It stresses the importance of coordination and control across the processes, systems, and functions needed to determine, design, deliver and support services along with a focus on continual improvement of both the services and the process used. The life cycle is organized in 5 stages consisting of 26 processes offering best practice guidance on implementing IT Service Management (ITSM). Each stage contains a set of processes, key principles, and activities relative to that area of ITSM. So, where do you begin to implement ITIL? Deciding on just where to start when implementing ITIL can be a daunting and confusing task for any organization. 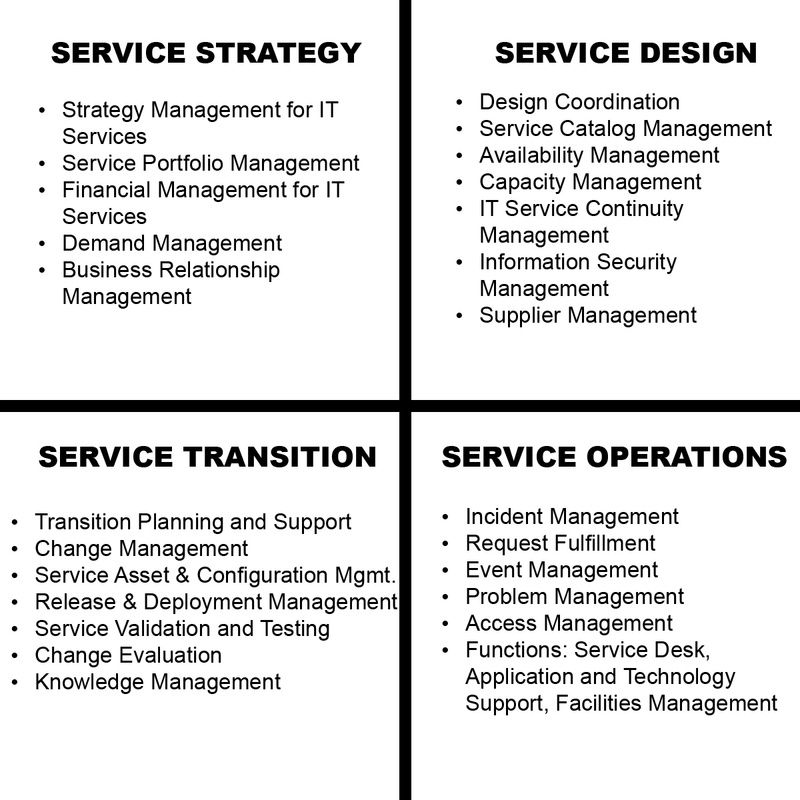 It may seem that the Lifecycle has a logical starting point, that being Service Strategy. Then progressing through Service Design, to Service Transition, Service Operations and finally Continual Service Improvement. And if you were starting from a clean slate and just beginning to build your service management organization, that would be a great choice. Identify your customers, determine the services they need to achieve their outcomes and how they would get value from those services, and then develop your strategy for how you could develop the organizational capabilities to design, support and deliver those services. But most organizations are not starting from a clean slate. They have services they are currently delivering, they have some form of process in place, even though it may not be well documented, and they certainly have customers who are expecting services to be delivered and supported. 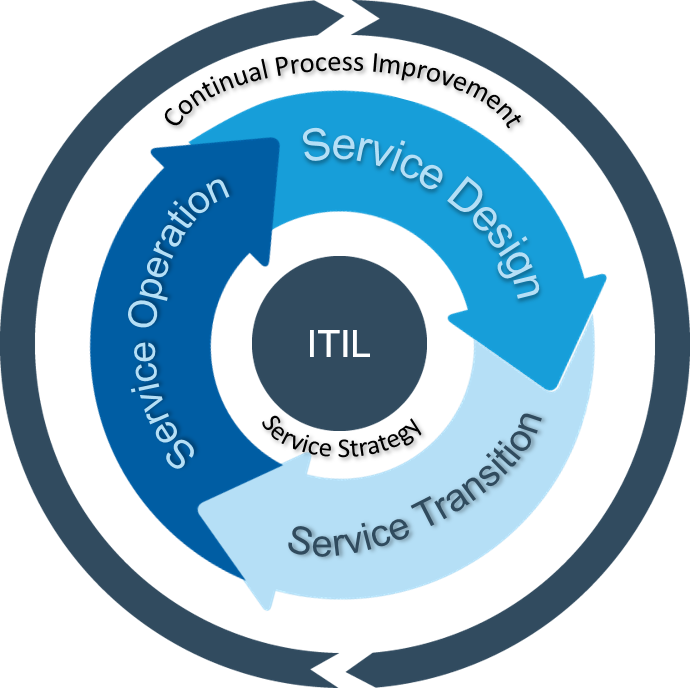 Fortunately, the ITIL Service Lifecycle is designed to allow you to start at any point in the lifecycle and “adopt and adapt” the processes, concepts, and activities that address your needs. To understand where best to start, it might be useful to understand exactly what is addressed at each stage of the Lifecycle. The chart shown below lays out the Lifecycle and identifies what is being addressed in each phase of the Lifecycle. Using the chart above, think about your organization. What are the pain points? Where are you having difficulties today? Are you having trouble maintaining user satisfaction with the delivery of your services? Failing to meet service levels or to minimize the impact of outages when they occur? Then perhaps you may need to look at the guidance provided in the Service Lifecycle for Service Operations. Are you having issues with changes to the services and often causing or introduction risk into the business by having changes fail or not deliver what was expected? If so, you would want to look at the guidance provided under Service Transition and the processes defined in this stage. Are you struggling with keeping up with changing business needs? The Continual Service Improvement would be the area of guidance needed or possibly even reviewing your service strategy and how you better understand the Services needed and your strategy for providing these as outlined in Service Strategy. As mentioned earlier, there are 26 processes defined in the 5 Service Lifecycle Stages. Once you have identified the activities that are pain points or need additional attention, these are the processes in each stage that should be looked to for guidance. So, to answer the question “Where do we begin to implement ITIL?”, you begin with where it helps your organization the most. Pick the processes that will provide you with the most benefit and build from there. Many organizations begin with Incident Management and Request Fulfillment as these are usually the most customer-facing processes and often have immediate impact and benefit. Most soon see that while these processes help put out fires, they usually don’t stop them from starting, so the next step is perhaps Problem a, Knowledge Management and/or Change Management. In closing, remember that when implementing the ITIL framework and ITIL Service Lifecycle as part of your ITSM solution, the mantra is “Adopt and Adapt”. Chose the best practices that address your needs and then add or take away any steps or activities that do not. And always look at other approaches like Lean, Agile, DevOps, Cobit, etc. as all of these will compliment ITIL and help you to bring out the best from the ITIL Service Lifecycle. For more information about the ITIL Service Lifecycle, join Chuck Spencer for his ITIL Lifecycle webinar series where he digs deep into each cycle. Written by Chuck Spencer: Flycast Partners ESM Practice Lead is a certified ITIL Expert and trainer with over 30 years of experience in IT Service Management. He holds additional certifications in Organizational Change Management, ISO 20000, Cobit, and Scrum and is a Lean Six Sigma Black Belt. explain the importance of the service lifecycle as a comprehensive approach to service management? i wish for enjoyment, for the reason that this this site conations genuinely pleasant funny data too.